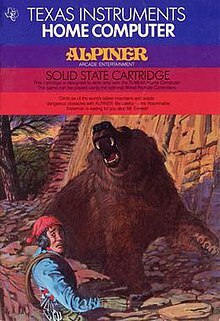 Alpiner is an action video game designed by Janet Srimushnam for the TI-99/4A computer and published on cartridge by Texas Instruments in 1982. In the game the player climbs the worlds six highest mountains while avoiding obstacles such as trees, animals and falling rocks or landslides. The mountains in the game are Mount Hood, The Matterhorn, Mount Kenya, Mount McKinley (now known as Denali), Mount Garmo, and Mount Everest. The names of the mountains along with their corresponding elevations appear on the main screen. After selecting 1-2 players and moving past the main screen with the mountains and elevations the game begins. The player must climb the side of each mountain and make it to the summit in the allotted time. Obstacles placed in the alpiner's way include falling rocks, wild animals, trees, and brush fires that they must avoid to continue up the mountain. In level 7 the avalanche obstacle is introduced and in level 13 the ice falls. Being hit by obstacles will result in sliding down the mountain, some further than others. If the alpiner slides all the way down the mountain one of the lives are lost. Players receive an additional life every time they make it to the top of Mount Everest. There are 18 levels in the game divided into 3 rounds, the player must climb each of the six mountains successfully to continue on to the next round. The game can be played with or without the commentary or voices, but to play with them requires the use of the TI Solid State Speech Synthesizer. The voices and commentary help to warn you of approaching obstacles and comment on your progress. The music heard during gameplay is Anitra's Dance from Act IV of Peer Gynt by Norwegian composer Edvard Grieg. The music heard after reaching the top of Mount Everest is a fragment of the Suite No. 2, in D Major II - Alla Hornpipe; from Water Music, by German composer Georg Friedrich Händel. ^ a b c d Alpiner. Texas Instruments Creative Communications. 1982.